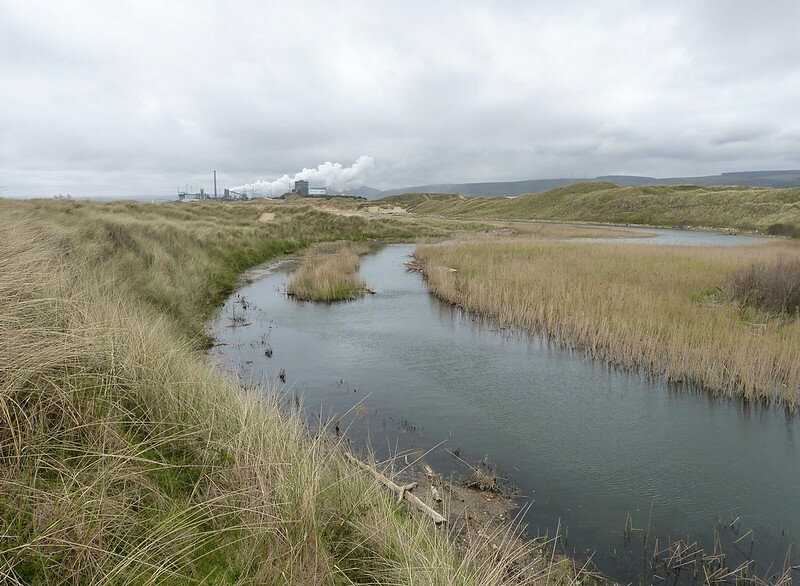 Past experience has taught me well that hot, sunny days are definitely not the best conditions for several miles of walking through Kenfig's extensive dune system. Overcast and breezy weather however is ideal so Saturday's drab and chilly start was just the ticket for my first visit to the reserve this year. 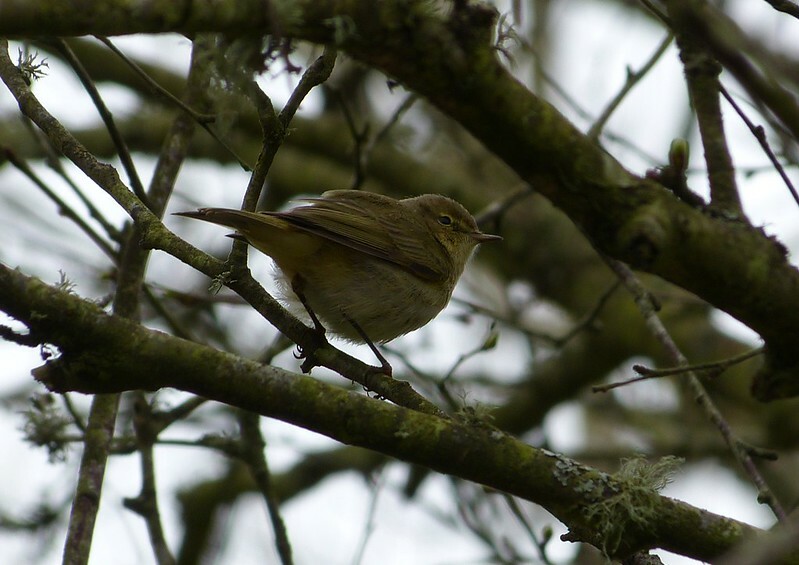 Right from the offset it was clear that Chiffchaffs and Willow Warblers had arrived in good numbers with at least six of each seen and heard on the short walk down to the main hide. Keeping with tradition most avoided my camera's gaze until this shady chap was caught unawares. Out on the pool things were, as warned by a couple of departing birders, extremely quiet with nothing more than a Coot, Moorhen and distant Great Crested Grebe. To be honest that came as something of a disappointment but a couple of foraging Chiffchaffs kept me amused until six overflying Lapwings provided some excitement, quickly followed by a Kingfisher. The latter was as resplendent as always and put on a good show as it dived for food a couple of times along the cutting furthest to the left. Moving on and my trip around the pools perimeter confirmed that the solitary Greylag Goose is still present amongst its adopted Canadian family who were making good use of new grass growth. A Mute Swan and Pied Wagtail were the only other birds present (it really was that quiet, not even a Swallow) until a calling Cetti's Warbler and Reed Bunting quickened the pace. Singing Skylarks and territorial Meadow Pipits kept me company through the dunes but here the real interest was to be found at ground level where hundreds of Orchids are just coming into flower. Initially this took me by surprise but considering the amount of colour springing up in my own garden they're probably bang on time. My amateur observations seemed to pick out two different species, both of which have completely baffled me this evening while looking for an exact ID. Any ideas? 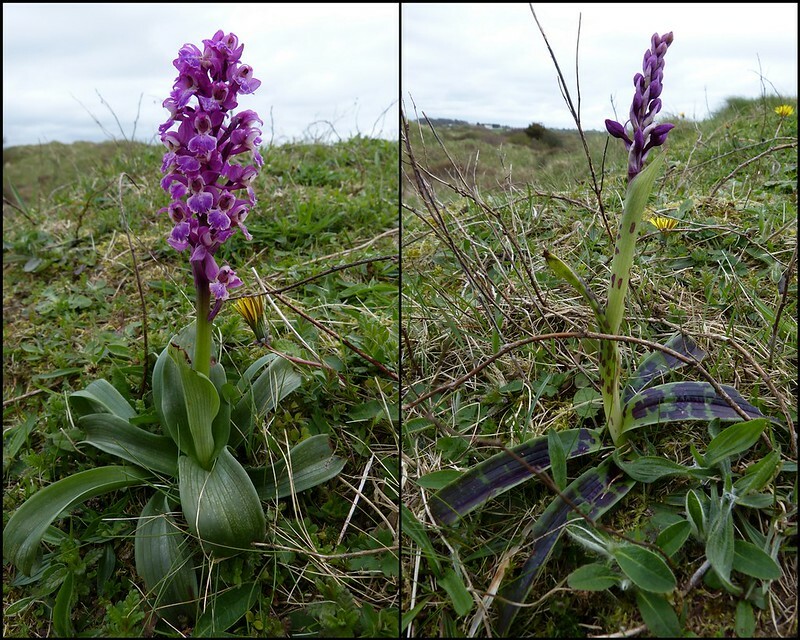 Update: Many thanks to David Carrington, reserve warden at Kenfig, who has identified both these specimens as Early Purple Orchids. Apparently the species is highly variable when it comes to the amount of spotting seen on the leaves, hence my confusing these as two different varieties. Down at the old haul road it was decision time. Should I turn right and check out the marsh or left towards Sker Point. Given that the alternative was fielding revision questions from Emma, taking a little longer to do both seemed like the ideal option. A couple of miles later and I was looking over the rivermouth and marsh beyond where finally we had some hirundine action. I counted at least eight Swallows and a single Sand Martin hawking for insects while along the fence line a flock of Linnets were accompanied by three White Wagtails, my first of the year. Though my views were only brief their pale backs stood out a mile and served as yet another step along the spring migration ladder. Turning south I enjoyed walking along the beach in complete solitude with just a small flock of Ringed Plover and Sanderling for company. Who needs anything more? Sadly that isolation continued at Sker where despite a rising tide there was literally nothing on show, not even a passing Oystercatcher. A couple of displaying Lapwings 'nintendoing' over a flooded slack however proved a lovely sight and sound. In the same area two pairs of Stonechats did their best to brighten proceedings along with another couple of Swallows, but you couldn't help feeling that Kenfig is still in waiting. Another few days and hopefully things will pick up. I'll be back. Thanks, so for sharing your little expedition and all your sightings. Nice outing. 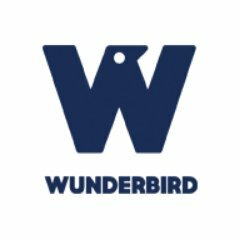 It is great to see the spring birds moving back in! Happy birding, have a great day!